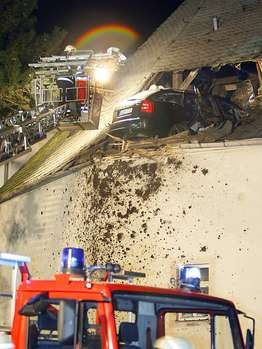 FUNNY CAR ACCIDENT: German police are investigating the cause of an accident which left a car suspended nearly 25 feet off the ground, halfway through the roof of a church. 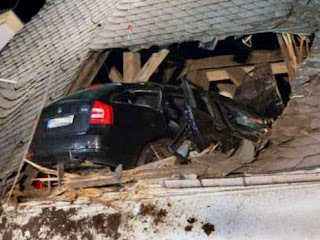 How somebody managed to put a station wagon into the church rafters is still undetermined. The accident took place in Limbach-Oberfrohna, just outside of Chemnitz, Germany. 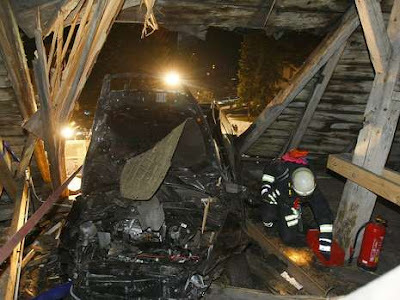 Police believe the 23-year-old driver was racing through the center of town when he lost control of his Skoda Octavia, careened off an embankment, and wound up wedged in the church seven meters up. 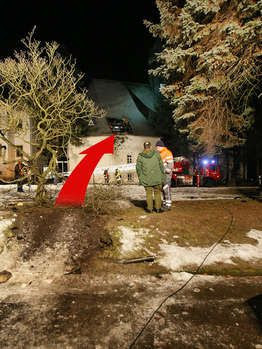 One police officer told reporters at the scene, "the driver took off due to unexplained circumstances, flew some 30 meters through the air and ended up seven meters up in the church roof." Investigators believe the car's speed led to the driver missing a turn. Just how the vehicle went airborne is still a bit of a mystery. "I've never seen anything like it," continued Officer Knut Wagner. The driver of the Skoda Octavia was extracted from the vehicle, and transported to the hospital with serious injuries. Damage to the vehicle has been estimated at €10,000. Meanwhile, the town's church was badly damaged from the accident, but the cost of the damage has yet to be assessed. Investigators have requested the assistance of physicists in the accident reconstruction. At its most powerful, a stock Skoda Octavia can get up to 197 hp and 207 ft-lb of torque from a 2.0-liter four-cylinder 16-valve TFSI vRS engine. With that engine, and no other tuning, it has a top speed of 150mph, and a 0-60mph time of about seven seconds. Police and medical workers will carry out testing on a blood sample taken from the driver to determine if alcohol or drugs played a role in the incident. 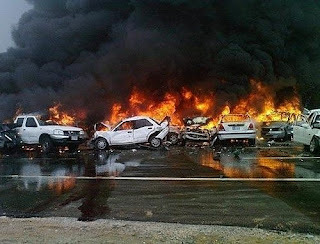 More then 200 cars were involved in massive crash on 25km stretch of Abu Dhabi-Dubai highway near Ghantoot. 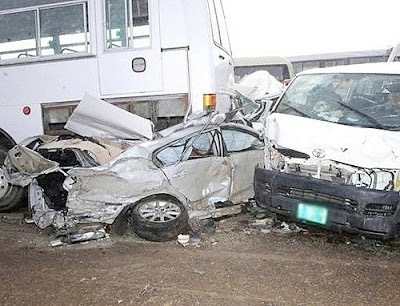 Terrible accident happened during the morning rush hour due to heavy fog lingering the air. 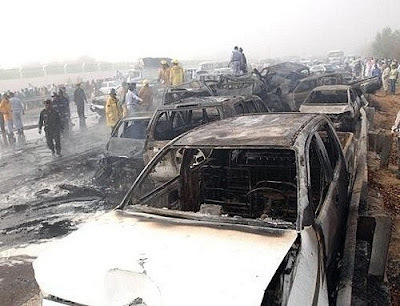 At least 6 people died, and hundreds injured in biggest traffic accident ever in Abu Dhabi. Rescue team had a hard job due to bad weather. All victim were sent to the nearest hospitals. To add more casualties to the number of victims, there were 12 loads of buses carrying about more than 300 laborers to work at the same time of the crash. The cause of this terrible accident was due to poor visibility of the road. Everyone was speeding despite the bad weather and the 120km/h speed limit along the highway. Drivers did not leave a safe distance between cars and this resulted in everyone hitting each other after the first crash, according to an Abu Dhabi traffic police officer. VIDEO: Plane hit the cow! The video footage shows the moment when the craft hit the cow, which fell and rolled down the field. The pilot said the cow got up and continued grazing, as if nothing had happened. According to news agencies, the report of the investigating office for plane accidents stated that, unlike the animal which was uninjured, the plane was seriously damaged. 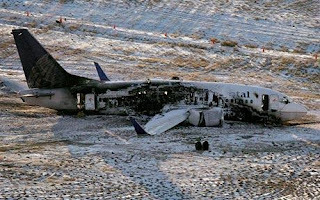 58 people were injured in the a plane crash in Denver, but no one was killed. What a luck. Denvers firemens compared to a scene from a disaster film. The entire right side of the plane was burned, and melted plastic from overhead compartments dripped onto the seats. Investigators said the plane's left engine was ripped away along with all the landing gear. "It was just amazing, and big miracle that everbody survived the impact and the fire." said Bill Davis, an assistant Denver fire chief assigned to the airport. There were no fatalities but some passengers suffered broken bones and two were in critical condition with fractures following the accident on Saturday evening. "By the time the plane stopped we were burning pretty well and I think I could feel the heat even through the bulkhead and window," said Mike Wilson, a passanger. "I made for the exit door as quickly as I could, fearing the right wing might explode from the fire. Once out, I scrambled down the wing." Reason for this accident could be snowy adn cold weather at the time of accient. Miraculously survived bike accident without a scratch!? Really weird accident happened in Los Angeles. Traffic on a highway was stopped when a big truck got crushed. He crashed a car! Fireman's and police did they best, lift up truck with the crane and draw out man from car. Everybody was shocked and happy when they saw the car driver alive. Without any scratch! What a luck!